Katie Wells was used to her fast-paced schedule as a busy high school student in Oregon. But when she arrived in Bosnia and Herzegovina with the Kennedy-Lugar YES Abroad program, she experienced a few cultural surprises. 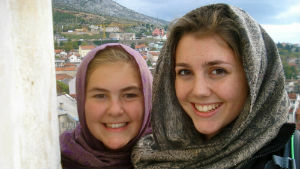 Katie’s passion for culture, language, and food was a perfect fit there, and she says her year of endless exploring has left her with “calves of steel.” But the most memorable parts of her experience came in learning the Bosnian language and putting it to use. She recalled the pride she felt one morning when she was able to hold a conversation with her host mother in simple Bosnian. Interacting with her host family and those around her has helped Katie appreciate diversity; and community service became an important part of her schedule. She volunteered at an orphanage, retirement center, and other events in Sarajevo as a youth ambassador and helped to disprove stereotypes about the American culture. Through the YES Abroad program, Katie has realized her childhood dream of traveling overseas to “see what else was out there.” Blogging about her journey has made her interested in sharing her adventures with others, and she hopes that will eventually become her life’s work. Her curiosity, she says, will never change.